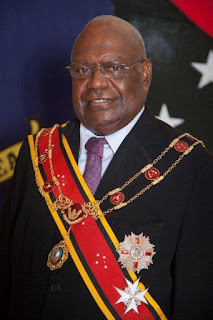 The Governor General Sir Michael Ogio has died, passing away in Port Moresby this afternoon. A statement from Government House this evening, says Grand Chief Sir Michael, the country's ninth Vice Regal, died at the State residence at Government House. Seventy-five year old Sir Michael Ogio, from Tinputz in North Bougainville, has been sick for a long while. He underwent a coronary heart bypass surgery in Singapore in November 2015, and was medevacked to Brisbane, Australia, last October for urgent medical treatment. Sir Michael Ogio's six year term expired on February 24th. He was awaiting the handover-takeover of Governor General-elect, Bob Dadae, when he died. Acting Official Secretary Ezekiel Vene asked people to pray for peace and comfort for the family of the Governor General, and also the public to respect the privacy of his family. Meanwhile Prime Minister Peter O'Neill has expressed his condolences. Mr O'Neill says Sir Michael Ogio was an outstanding representative for the people of Papua New Guinea as a Member of Parliament, a former Deputy Prime Minster, and as the Governor General. Grand Chief Sir Michael Ogio is survived by his wife Lady Esmie Ogio, five children and eight grandchildren.